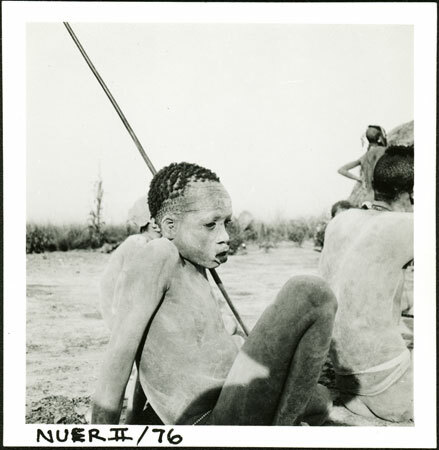 A profile portrait of a youth sitting on the ground, his body and face covered with ashes that accent his gar initiation marks on the head. Evans-Pritchard's shadow falls across the youths legs. The youth is obviously aware of Evans-Pritchard photographing him, but has either been requested not to look at the camera or else is disinterested or at ease with his presence, a more likely scenario. The youth is probably a resident of Nyueny village in western Nuerland where Evans-Pritchard spent 5 weeks in 1936. Note on print reverse ms pencil - "9 W.Nuer" & print front border ms ink - "NUER II/76"
Morton, Chris. "Portrait of a Nuer youth" Southern Sudan Project (in development). 03 Jan. 2006. Pitt Rivers Museum. <http://southernsudan.prm.ox.ac.uk/details/1998.355.87.2/>.